I’ve been on a very unMinusCar like vacation. Happy Thanksgiving and all that. We went to the tropics. The wind blows too much where I live to get many shots like this. and saw the sun set on the other side of the island. Ever heard of the Reverend Billy? He leads the Church of Stop Shopping? Morgan Spurlock produced a movie about him, "What Would Jesus Buy?" May have opened tonight in a cineplex near you...didn't open tonight in mine. I wonder if it's showing somewhere in South Carolina. "Try to buy your gift right in your own neighborhood. Walk to your gift this year. Maybe take a bicycle. You don't have to get in that SUV this time." Monday the weather tricked me. It got colder as the day went on and the soon to be headwind increased too. After work I made a last minute dash to a bus stop to try to get a ride at least for the headwind parts. I caught the bus but a combination of events conspired against me; at one point during the mad dash my forward momentum stopped and I, unable to de-clip, toppled over in the presence of an appreciative audience. I drove one single occupant mile that day…I decided not to make my surely underdressed The Boys walk home with me from school. Wednesday was a good day. I caught The Dad departing his job and we rode together most of the way to his home. It was his birthday. Happy Birthday The Dad! Saturday we had an appointment at the Dell Rapids Pizza Ranch with The In-laws. I stepped outside and couldn’t help but notice what would be a tailwind and 50 degrees. Since the best way to enjoy a pizza buffet is by biking to it, I packed some clothes and headed out. I ran out of daylight, temperature and wind before I got to Dell Rapids. I got off the dark highway in Baltic and begged The Wife to alter her route to pick me up. She did. I think I ate a slice of pizza for each of the 20 miles I rode to get there...it's probably good I didn't ride all the miles to get there. It all starts at the grocery store with my weekly 2 apple fritters and grande chai tea latte. They know me there. She said every window she saw this morning had frost on it. I said I didn’t need to scrape a thing to ride my bike today. I just blink occasionally to clear away the ice crystals. From the store with latte in hand I roll against the traffic on the sidewalk. DON’T DO THIS. Riding against traffic, sidewalk or not, is a very good way to end up doing automobile undercarriage inspection. One of the most common ways to accomplish that comes courtesy of the right turning motorist. So intent on the spacing of traffic to their left, they almost never check their right until they’ve started their turn. So it was that I came upon a crosswalk, green light, walk sign brightly beckoning, and I’m stopped at the curb looking at the back of a driver's head. I could have laid out a table setting on the hood of her SUV and been half way through my fritters before she knew what was happening…she also would have driven away with half my breakfast. Sometime it would be fun to ride in this dangerous manner with a helmet cam just to catch the instant when drivers realize they never ever, not once, checked to the right before making that turn. This morning it would have been priceless. I went long on the way home. I love this time of year because I love night riding. During summer I have to patiently wait for enveloping darkness. In November the darkness comes to me. I saw The Dad on his way home from work on his bike. A few minutes later I froze two deer with my helmet light...and that was an ultimate ending to a very good bicycling day. Big thanks to long time MinusCar reader and forever patient Noel for pointing me to the article referenced below. It took an “oil-belt Texan” and $1.1 million in cold hard cash, but convicted felon and national evangelical Christian leader Chuck Colson has finally put into words something helpful and constructive about global warming. He says, "Just Do It." Somewhat surprisingly he means take action. "…huge societal problems are very much like icebergs. They are huge; massive, with tremendous momentum and inertia. Walk up to an iceberg (standing on anything you can) and push on it, as hard as you can. You will not see ANY response from the iceberg; it's just too massive for you to affect, you and all your force are infinitesimally small in comparison to the berg." But it’s worth doing your own pushing. And if everybody pushes, even if some push in the wrong direction, eventually the iceberg could move in a favorable direction. LBBW is happy to report (and I'm happy to read) that the iceberg is moving. I’m happy to report that on November 2, 2007 Chuck Colson gave his own little push. Somebody alert James Dobson. It turns out Chuck Colson has a friend named Bill. “Bill is a solid Christian, a native oil-belt Texan, a conservative, and an environmentalist wrapped up in one.” (No need to apologize for him Chuck). Bill, through his company Energy Education, Inc, helped a 7,000 member congregation in Texas save $1.1 million in energy costs by, you know, teaching them to turn off lights and stuff. "Working with institutions to reduce their energy usage, like Energy Education does, is good stewardship. And it does not depend on what the scientists eventually can prove about global warming. It is all laid out for us already in the Scriptures. All we have got to do is stop arguing long enough to start being good stewards today." In the scriptures? I’m 11 months ahead of you Chuck. Start today? I'm on it. Stop arguing? Does this mean you'll stop trying to get Richard Cizik fired? What’s a church do when they pull off the drywall to add insulation and they find $1.1 million in energy savings? I don’t know. But The MinusCar Project has recently come into some money. The other day, after a long week of sitting in the driveway, I found dollars leaking out from around my car's gas cap. I know this sounds weird, but everytime we take a sock off the clothesline there's a dollar in it. The rest of Chuck Colson's actual words can be found here. Maybe it’s the lower temperature showers. Maybe it’s the lower temperature house. 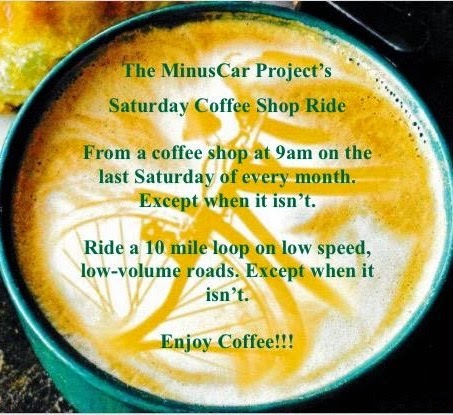 Maybe it’s the lower temperature bikes rides. Maybe it's a massive cold temperature feedback loop, causing increased comfort in colder temperature. I broke new ground, I made a new high in low, I can now ride to work without a jacket down to around 30 degrees. This is about 10 degrees cooler than previous years. The downside of this is the margin for error is lower. A flat tire or injury could lead to some new experiences in cold, but overall I’m happy with this turn of events. I have found it necessary to store a jacket at work though. Riding to work without a jacket is one thing, walking for or to lunch without one is unbearable. I drove to work Thursday. I couldn’t get started in the morning which led to a choice between being a little late and a lot late. I chose a little. I drove. Friday I drove alone after riding into downtown to get The Wife’s car. I fetched The Boys from school and left them with The Wife while I met Snakepants for Friday night enchiladas. We talked about plans and goals for the new biking season (I guess that means fall begins a new biking season)…and yes, we talked about you. This weekend I noticed The Google has a new photo of my house. I’m pleased with how it turned out. The MinusCar Car is right where it belongs. In the driveway.